An open letter to LSU football fans: 2018 looks daunting, but at least it's never boring around here, right? We don’t know for sure that the Crimson Tide will extend its 7-game win streak against the Tigers. But the trepidation that you have come to feel leading into the Alabama game has been permeating this whole offseason, hasn’t it? 1. You don’t know about the quarterback. You assume the starter is going to be Joe Burrow, but maybe it’ll be Myles Brennan. In either case it’s going to be someone who has limited experience. But Burrow graduated while he still had eligibility remaining, so he must be smart, right? He was signed by Ohio State and has been coached by Urban Meyer, so he’s got to be really good, right? The Buckeyes think he will be. We’ll see. For years, you’ve been waiting to see the Tigers throw the ball more. Well that’s something you can count on. How effective they’ll be, well we’ll see. 2. You’re not sure about the offense as a whole. 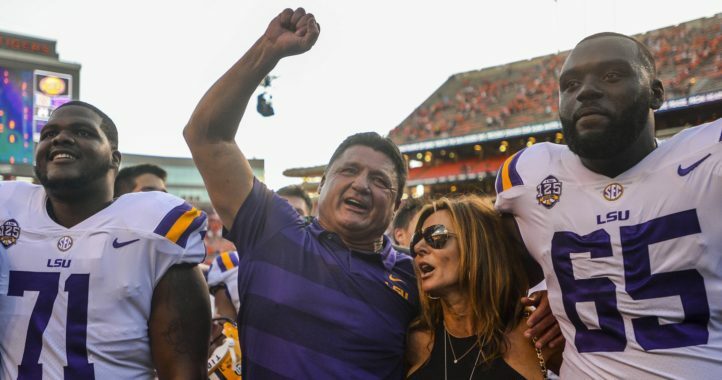 If Steve Ensminger is such a great coordinator, Ed Orgeron would have kept him after the 2016 season and not hired Matt Canada while Ensminger went back to his role as tight ends coach, right? Well, Orgeron was feeling the pressure of many supporters questioning his hiring on a full-time basis because he wasn’t a big-name, proven head coach, and he felt compelled to hire a big-name proven coordinator such as Canada, right? The circumstances weren’t right for Ensminger, but he can handle the job, right? Orgeron made a mistake, recognized it and corrected it. Right? Could be. 3. 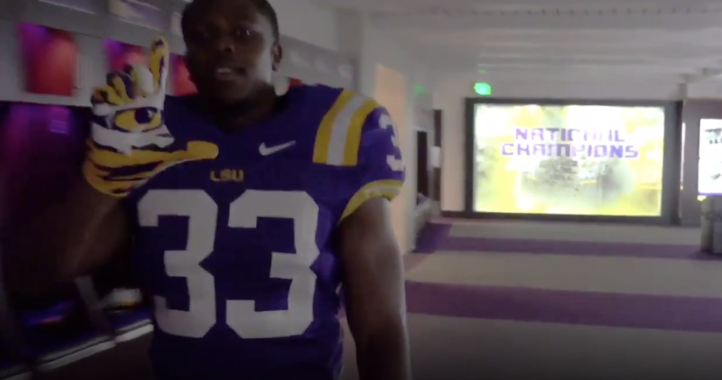 You can’t remember the last time LSU entered a season without a proven running back, right? But this is LSU. It always has stud running backs waiting in the wings. Clyde Edwards-Helaire will be fine, or Nick Brossette. And those freshmen – Chris Curry and Tae Provens – they’ve got to be studs, right? Now before you let all that uncertainty overwhelm you, keep in mind that the offensive line figures to be a strength. And if that doesn’t make you feel better, think about the defense. Dave Aranda. Say the name a few times like a mantra. As long as he’s the defensive coordinator, there’s hope, right? Sure. Plus he said just last week that the front seven is the deepest he’s had as he enters his third season with the Tigers. Remember when the LSU defensive line was at the forefront of national champion teams and contenders? It wasn’t as long ago as it might seem. Remember Michael Brockers, Bennie Logan, Keke Mingo and Sam Montgomery? Good times back in 2011. Well, right up until that damn BCS game and the rematch against you know who. Remember Glenn Dorsey, Tyson Jackson, Kirston Pittman and Marlon Favorite? Yeah, so does Ohio State. Remember, Marquise Hill, Marcus Spears, Kyle Williams and Chad Lavalais? Yeah, so does Jason White. This year’s line might not be as good as those, but it has a chance to be special, and there has to be something special somewhere if this team is going to contend in the SEC. The defensive line is the best shot at something special. The linebackers won’t be that good, but with Devin White leading the way they should be good enough. There’s some youth in the secondary, but there’s also Greedy Williams. So as nervous as you are about the offense, you can be at least that much at ease about the defense. And what about the special teams? Well, the field-goal kicking has to be better than it was last year, doesn’t it? Probably. The defense should give LSU a chance every week, the offense should be more fun to watch and probably more balanced. Throw in an occasional field goal and this might not be so bad. Sure, the schedule looks even tougher than normal when you throw in Miami instead of some Group of 5 lightweight or even an FCS heavyweight, and Georgia instead of some SEC East team like, well, anyone else. But teams often wind up being worse – or better – in the fall than they appear in the summer, so why worry about the schedule before it gets here – even that early November thing? Besides, don’t you have enough to worry about with Orgeron? 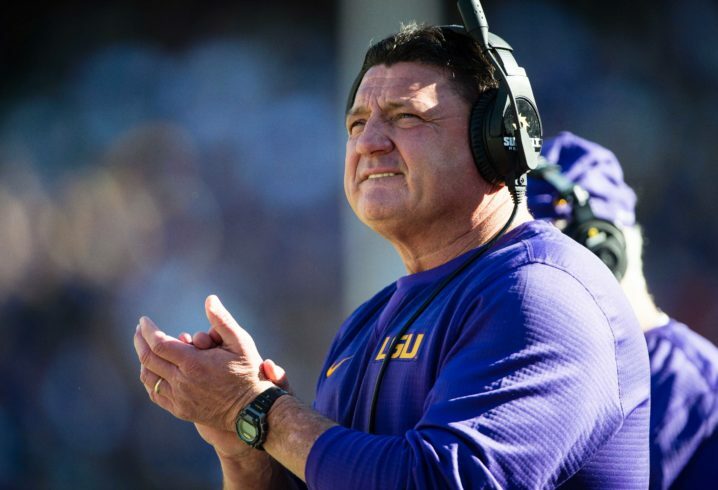 From the time he was given the job on a full-time basis after the 2016 season, you’ve had that gnawing feeling – is Orgeron up to this job? A year later you’re still not sure. As first full years in rebuilding jobs go, last season was adequate. No more, no less. It’s nice that Orgeron bled purple and goal long before LSU ever offered him a paycheck. But that only takes you so far. It’s time that he takes the Tigers farther than the Citrus Bowl, which is where he took them after the past two seasons. Finishing 9-4 and second in the SEC West is supposed to be an average year at best. And deep down, you’re fearing that this season might actually be below average. But don’t forget, one of the main reasons Orgeron was hired was because even though his head-coaching resume was weak, his recruiting resume was strong. His ability to recruit as a head coach is just now bearing fruit. Be patient. And if the worst does happen, remember, early signing day starts right before Christmas. F you, you dumb moron! This site has the worse ignoramuses masquerading as somehow being writers! Real classy retort. Do you respond in kind to everyone that speaks the truth to you? Quite frankly, I don’t think Alabama is anything other than an afterthought as of now. We have a lot more things at the forefront with the tough teams LSU has scheduled prior to that November matchup. Let us get through Miami, Auburn, MSU, and UGA and we can start thinking about Bama. Like you, that disgrace couldn’t recognize the truth if it stared him in the face, winked at him, and then spit in his eye. I think there is room for optimism for LSU fans – For better or worse, the Les Miles era will formally end when Orgeron is let go. You’ll have a complete fresh start, not the retread whose interim status should never have been made permanent.